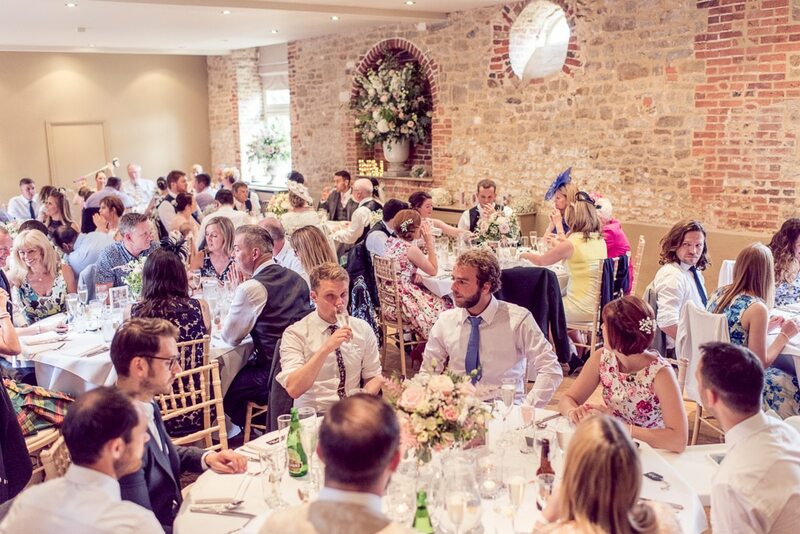 HD-DJ provided their Sussex wedding DJ for one event management. They provide wedding DJ entertainment in Sussex, Surrey and London. They provided their evening only wedding DJ service, otherwise know as the GOLD package. Pippa and Lloyd added an uplighting package, which helped to take this beautiful Sussex venue from day to night. DJ Pete left his home nice and early. This allowed up to 80 minutes travel time for a journey that should only take 50 minutes. However, it was a beautiful sunny afternoon across Sussex, so naturally the roads were congested. The Sussex wedding DJ actually arrived at 6.35pm. Thinking he was 5 minutes late, he went to unload and set up. However he was told by the event manager that the wedding guests had only just finished their first course. They would not be ready for the DJ to set up for at least one hour. The bride and groom, Pippa and Lloyd booked the uplighting package on top of the stanadard wedding DJ package. Sussex wedding DJ Pete had only 1 hour to set up everything including the uplighting. The uplighting was set to the colour burnt orange, as requested by the bride. With a limited amount of power sockets available and their locations were not helpful. This meant wedding DJ Pete had to think quick on his feet, armed with various lengths of IEC power cables and duct tape he got to work. Our Sussex wedding DJ installed the uplighting in just 15 minutes. This allowed him the remaining 45 minutes to set up the sound system and disco lighting. While the DJ was setting up, the guests were still outside in the garden. They were enjoying a lovely sunny evening in the Sussex countryside. Listening to a fabulous acoustic band that the bride and groom booked for their wedding. The bride and groom, Pippa and Lloyd, cut their wedding cake at 9.00 pm. They chose “Jack Johnson – Better together”. Immediately after, they performed their first dance to “Ben Howard – Only Love”. After the first dance, they chose “Aretha Franklin – Respect” well chosen by the bride and groom. This encouraged the more mature wedding guests to get up and dance. That’s exactly what everyone did!. There was many song requests from the bride and groom and the wedding guests. So this left very little time for this Sussex wedding DJ to add his own music choices in this DJ set. See below for the Music list that was provided! Our Sussex wedding DJ loved this party!. But all too quickly the wedding was nearly over. It was time for wedding DJ Pete to play the last song of the night at this Sussex wedding. The bride and groom, Pippa and Lloyd, chose “Take that – Never forget” as the final song of the evening. At the end of the night, as wedding DJ Pete was packing away, the venue asked for some business cards. As they would like to recommend HD-DJ to future clients. They said he had a very different vibe to the other DJ that works there quite a lot. Surprised at this, Pete asked why do you say that?. Their response was “The other DJ only plays 80’s and 90’s music, he is stuck in the 80’s. Your different though, you play the perfect mix of everything. Sussex wedding DJ Pete replied “Well I am very shocked, surely a good wedding DJ should play a good mix of music for everyone ?? ?” Oh well always learning something new!